Your eyes do not deceive you! This is no Decoy! The JUSTIFIED podcast is back, and it’s all about one man and one man only: Drew Thompson! In today’s podcast, Josh Wigler (@roundhoward) and Antonio Mazzaro (@acmazzaro) break down the hunt for the legendary outlaw Drew Thompson, long presumed dead but learned to be alive and in hiding as season four of JUSTIFIED begins. Taking a break from the big-bad-of-the-season formula that worked so well in seasons two and three, the fourth round of JUSTIFIED is more of a whodunnit, as Deputy U.S. Marshal Raylan Givens races to find and arrest Drew Thompson before several other interested parties get to him first, including Raylan’s old friend turned nemesis Boyd Crowder, and vengeful mobster Theo Tonin, represented by foul-mouthed Nicky Augustine. 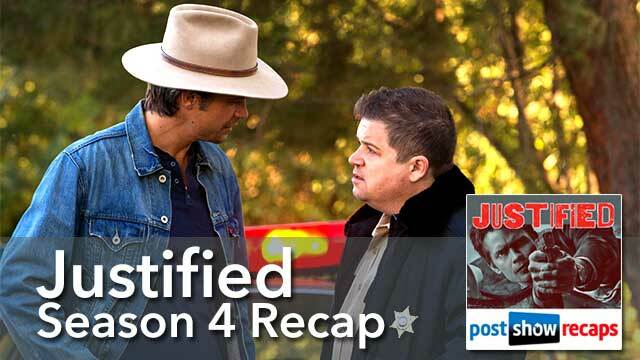 Josh and Antonio talk about JUSTIFIED shifting toward an overarching mystery for its fourth season, the continued descent into darkness for both Raylan and Boyd, the unexpected death of a pivotal character, the unexpected rise of U.S. Marshal Tim Gutterson, the first appearance of Patton Oswalt as Constable Bob, and an episode that just might be the very best JUSTIFIED episode of them all… among other topics. Soon, Josh and Antonio will conclude their rewatch with a discussion about season five. The final season of JUSTIFIED premieres on January 20, and Josh and Antonio will continue to recap each and every episode. 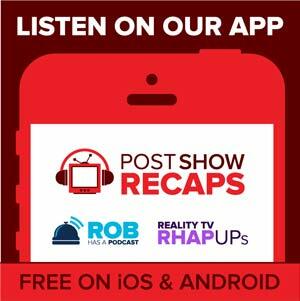 Send any questions and comments to Josh and Antonio on Twitter, or by using the feedback form at postshowrecaps.com/feedback.